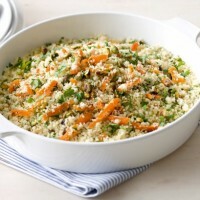 • Put the couscous in a big salad bowl and cover with 1 liter of slightly salted boiling water. Mix it together with a fork and let it sit for 15 minutes. • Cover the bowl with a plastic sheet and make a few holes with a fork to let some steam evaporate. Put it in the microwave for 3 minutes until fluffy. • Take away the plastic sheet, add the butter and mix with a fork Pour the couscous in a nice large serving plate and form a pyramid. 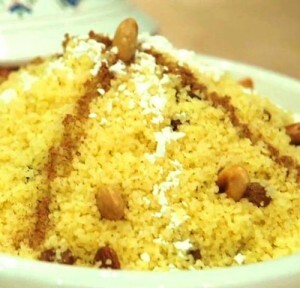 • All around, dispose, from the top to the bottom, a line of almonds, a line of cinnamon powder, a line of ice sugar, a line of dates, a line of pecan nuts, a line of dried raisins, until you finish the circle. 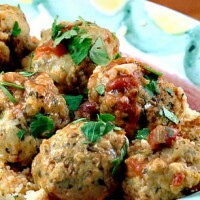 • Serve it with boiled milk and ground white sugar as you like.